The battle for disability rights in the workplace has been a long and tumultuous journey and though there has been much improvement, the battle is not yet won. Events like the London and Rio Paralympic Games may have sowed the seeds for a change in attitude and behaviour – but once the fanfare had subsided, some disabled people spoke out to say that their basic rights were still not being adequately met. There are many areas of life where disabled people might be at a disadvantage and work is one of them. According to the charity Scope, they are ‘more than twice as likely to be unemployed as non-disabled people’ and the obstacles they face are physical as well as metaphorical (i.e. other people’s misconceptions). Employers might wrongly believe, for example, that safety is a legitimate reason not to hire a wheelchair user, someone who is visually impaired or who has a mental health condition. Guidelines from the Health and Safety Executive (HSE) state that ‘there are very few cases where health and safety law requires the exclusion of specific groups of people from certain types of activity so employers could very well be breaking the law if they cite this. There may be times, particularly in industrial settings like warehouses and factories, when the risk of accidents is high. Spilled liquids, rubbish being stored incorrectly and uneven floors due to maintenance are all common hazards for everyone, though it can be much worse for disabled people. Workers who use a stick, for instance, could easily slip on a wet surface, while wheelchair users could find it difficult to manoeuvre around rubble and waste. In fact, HSE makes it clear that ‘while work in hazardous situations cannot always be eliminated, it can often be substantially reduced with ‘comparatively little cost’. Companies have a legal obligation to make ‘reasonable adjustments’ – but the challenge is to change people’s assumptions in the first place. The HSE goes on to highlight a number of examples, for example that a driver who has lost an arm cannot carry out their daily duties when all they need is an adapted vehicle. It also warns of banning people from doing certain tasks simply because they have a condition, rather than taking the time to find out what the individual is capable of doing. "If an experienced worker suffers a life-changing injury while in employment, surely it makes sense to adapt their environment rather than lose that talent and knowledge?" For a growing number of businesses, the question of disability rights in the workplace is not only about avoiding accusations of discrimination or an expensive and embarrassing tribunal. They have now realised that the cost of adapting a workplace is not as high as they imagined, particularly if they have managed to secure a governmental grant. Not only that, but helping more people into work brings many commercial benefits. Scope estimates that just a 10 per cent rise in the number of disabled people in employment would generate an extra £12 billion to the treasury by 2030. At a company level, it paves the way for a more inclusive and diverse workforce, with firms reporting that their disabled staff members are highly motivated and take immense pride in their work. Improving accessibility is not limited to recruitment either. If an experienced worker suffers a life-changing injury while in employment, surely it makes sense to adapt their environment rather than lose that talent and knowledge? Beyond the workforce, it means that a business can welcome anyone on to site, including customers, business associates, suppliers and inspectors who might have a disability. After all, nobody wants to be in a position where they have to explain to a visitor that their workplace is not safe for them. With the right support, there is no reason why a disabled person can’t follow their career ambitions in whatever field they choose. However, employers must play their part by removing as many barriers as possible and ensuring they are well supported. All employers have a duty of care towards their staff, regardless of whether or not they are disabled. From carrying out risk assessments to ensuring there are no obstacles where people could fall, it is a wide-ranging remit designed to prevent people being harmed while at work. Hazards are not just limited to industrial environments, but can also be found in the relative comfort of offices, leisure venues and transport hubs too. Wet surfaces, loose cables and general clutter may lead to trips and falls – though in dealing with these, managers must be mindful that they do not create additional barriers for people with disabilities. Where an unsafe area is cordoned off, there is a danger that the cordon itself will become an obstruction. It may be particularly problematic for those with sight issues since they could easily trip over it if they did not know it was there. "Figures from the HSE show that there were 37 instances where someone had died after falling from a height"
All this means that safety solutions must be reviewed continually to eliminate the dangers as far as possible, as has been the case with Ryder Europe, a commercial vehicle rental and contract hire company with centres across the country. The management team wanted to be able to cordon off the potentially dangerous pit areas used by technicians to service the vehicles. With a depth of 1.3 metres, there had been concerns that workers could fall into one of the pits if they were working nearby or simply walking past. Figures from the HSE show that there were 37 instances where someone had died after falling from a height, so there was a pressing need for safety to be stepped up around these areas. 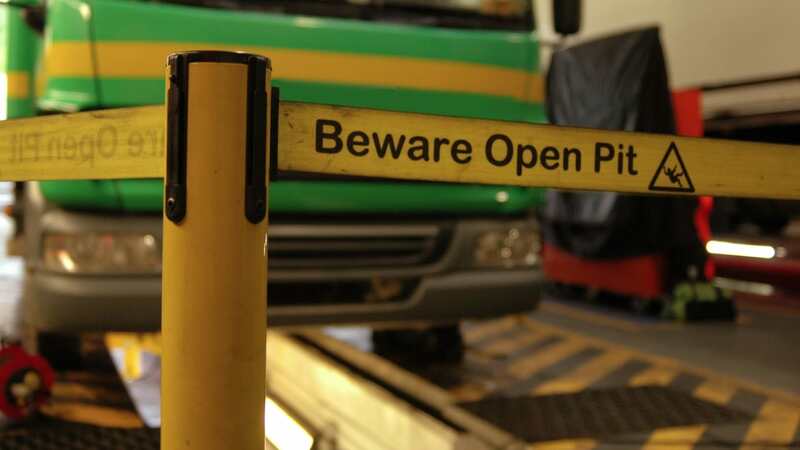 Ryder Europe tasked our team with implementing a new safety system, which included Tensabarriers, specialist pit bridges, printed webbing with a ‘Beware Open Pit’ message rolled out over nine months. Aware of the specific requirements of this project, we developed specialist brackets to allow the wall units to be attached directly to the pit bridges. With this system, safety messages could be clearly communicated to anyone who passed through the area. Increasingly, systems are about being safe and accessible for all, not just for those with disabilities. Reducing the instance of trips and falls is a priority for any reputable company – but in implementing the latest technology, employers need to be mindful of the effect it can have on accessibility. 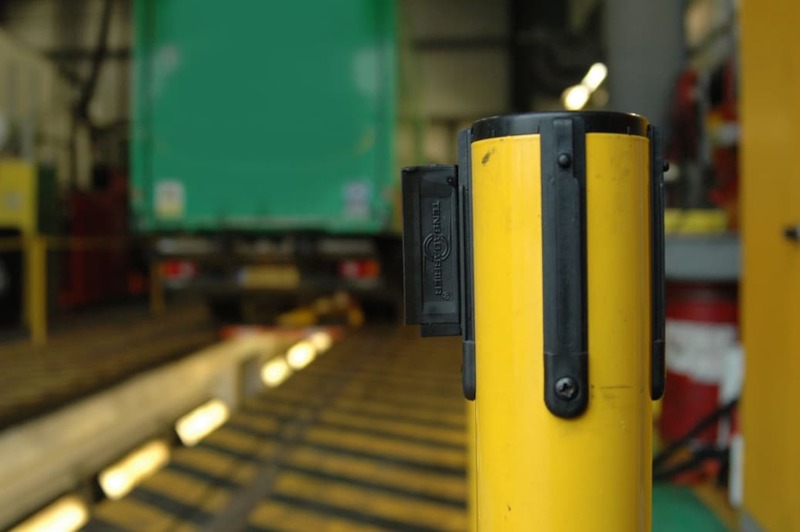 The Tensabarrier® system, for example, is widely used in areas of high footfall, often to cordon off areas that are unsafe for employees and/or members of the public. But there is little point creating a system that promotes the safe management of people if it creates additional trip hazards, particularly for those with mobility challenges. Aware of the physical obstacles that disabled people regularly encounter, we developed a low-profile base that can be used with our Tensabarrier®. The base is designed with a bevelled edge that measures just a few millimetres in height, allowing wheelchair-users to pass over it unimpeded. The low edges also help mitigate the risk of trips and falls for everyone, especially for anyone who uses a mobility aid or who is visually impaired. As is always the case with new products, we can only judge its effectiveness by how well it works for people. In the case of our low-profile bases, the development team was happy to hear that service-users at a disabled charity had found it easier to negotiate. In the coming years, we can expect to see more developments in safety systems like these, whether it is a brand new product or modifications to ones that already exist. Chances are, the majority of people won’t even notice them, but they will bring huge benefits for those who might be at a higher risk of trips and falls. Guidelines on disability rights in the workplace can be found http://www.hse.gov.uk/disability/largeprint.pdf.